Over five weekends in October, Reel Retro Cinema has been looking back at Dell’s attempts to bring big-time movie stars Frankenstein, Dracula, the Wolf Man, the Mummy, and the Creature to four-color life. Anyone with a heart condition must leave the room! For The Mummy, click here. And now … The Creature! 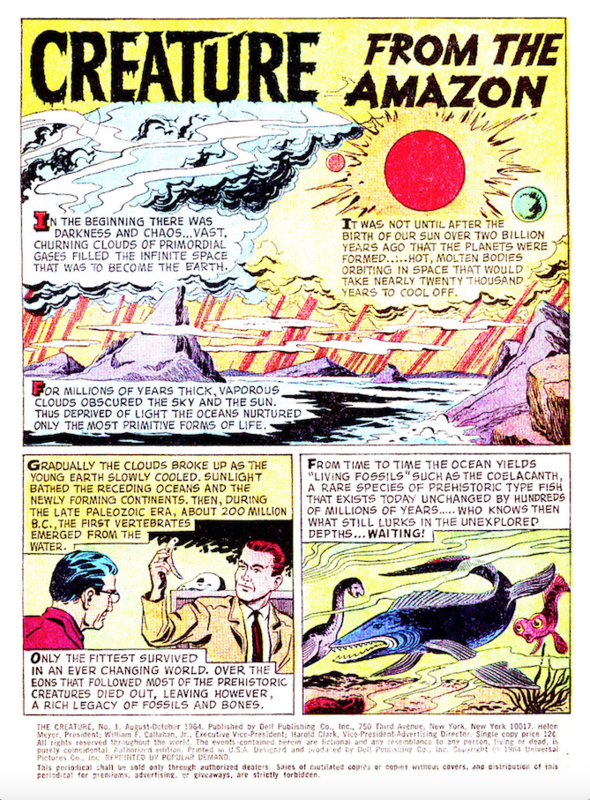 Published in 1963, Creature From the Amazon, written by Unknown and drawn by Bob Jenney, opens with a very wordy history lesson explaining the evolution of life on Earth. We are then introduced to paleontologist Scott Warden, who is feverishly investigating a mysterious fossil that was sent to his museum from a colleague in Brazil—a large bony claw that looks more than a bit like a human hand! A few weeks later, Warden receives another letter from Brazil, but this one is filled with bad news. Warden’s friend Arriaga—the one who sent the fossil—has disappeared. Warden wants to arrange an expedition to find Arriaga (and search for more fossils), but the museum doesn’t have the funds for such an expensive venture. The museum’s PR director, Bob McIntosh, proposes an idea—to team up with an idle millionaire Dudley Gaustad, who goes on treasure hunts, mostly for the publicity. Gaustad agrees, and brings along Olympic swimmer Monica Love and her brother, Mitch. Once the crew makes it to the Amazon, they meet Vargas, the captain of the boat that will take them down the river. Warden wants to venture into a small lake that isn’t found on any map. While stopping for drinks at a sleazy bar, Vargas tells him that the locals call it the Lake of Death, and it will be very difficult to find anyone willing to go there. Two ex-Nazis overhear this conversation, and offer their services in exchange for the gold they expect to find at a shipwreck rumored to have taken place at the Lake of Death. Monica notices the Death’s Head ring one of the men is wearing, and tries to talk the others out of hiring the two men. But Gaustad insists since this is his party, they have to follow his decision, and he plans on taking Kurt and Rudolph along. 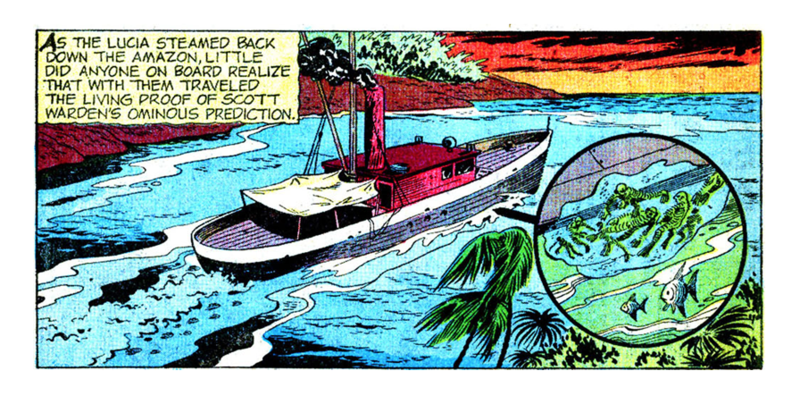 Vargas pilots the boat to the Lake of Death, which doesn’t look all that threatening to everyone. They drop anchor, not realizing that a creature waits below! Monica goes for a pleasure swim, and the Creature watches from afar. Scott and Dudley go exploring, bringing with them a large net. After they climb back on board, the ship suddenly lists to one side—the Creature has been caught in the net! Afraid the boat will sink, Scott cuts the line, unknowingly freeing the Creature. Later that night, base camp is set up, and the Creature wanders on land, attacking some of the boat’s crew, tearing them to shreds. The Creature leaves footprints behind that look suspiciously like the claw fossil. It’s at this moment the (ex? )-Nazis decide to make their move, telling Scott, Dudley and the rest that they will be forced to search for the gold believed to be at the bottom of the lake, immediately! While in the water, Dudley is savagely attacked by the Creature. Piranhas, smelling Dudley’s blood, finish the job. 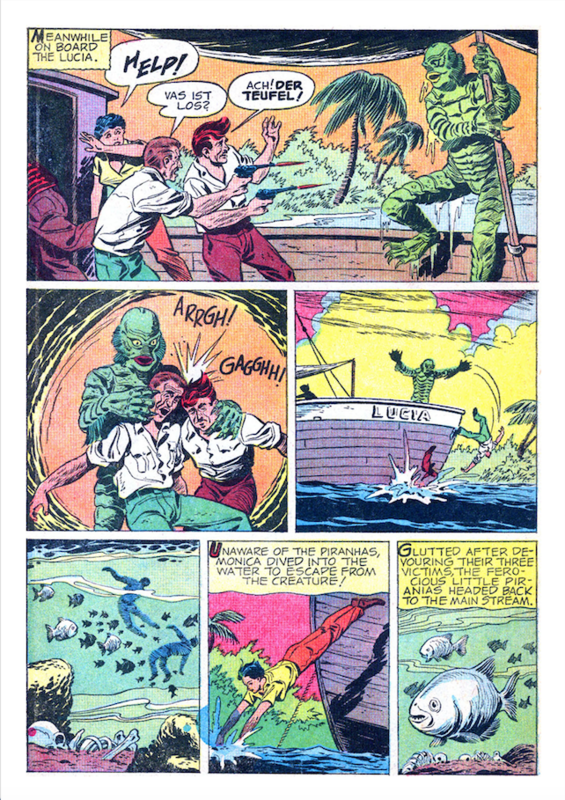 The Creature then climbs aboard the ship, throwing the Nazis overboard. Monica dives into the water to get away, and the Creature gives chase. He (it?) almost reaches her, when Scott and Mitch attack the Creature with spear guns, severely wounding it. 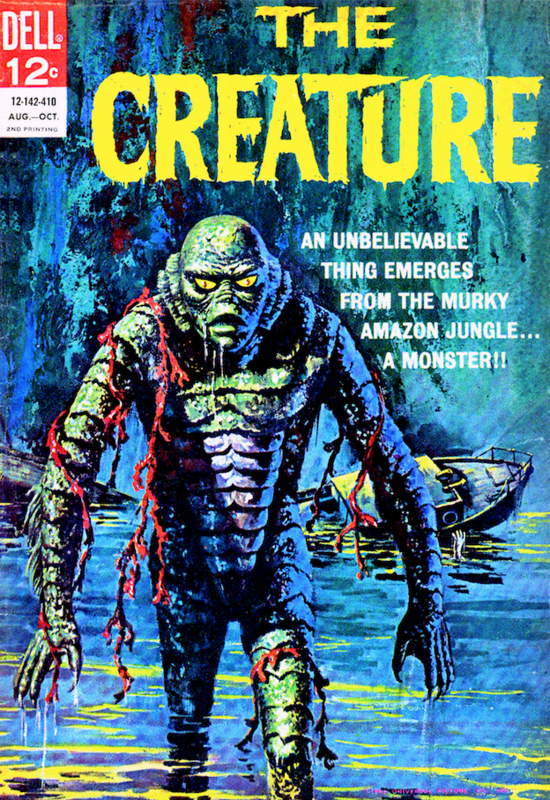 Dell’s The Creature is a frustrating read. It features the best cover of the bunch (again, the work of Vic Prezio), and it actually makes some attempt to adapt the classic film. 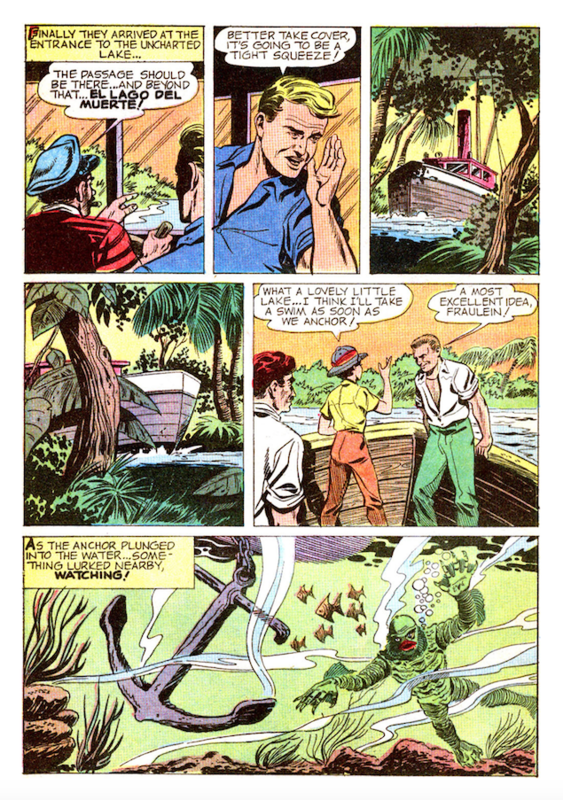 All the character names are different, but the roles they play in the story are pretty much all here—Scott is the comic’s version of the film’s square-jawed hero, Dr. David Reed (Richard Carlson), Monica is Kay Lawrence (the lovely and iconic Julie Adams), and Vargas is the earthy Captain Lucas (played by Nestor Paiva). 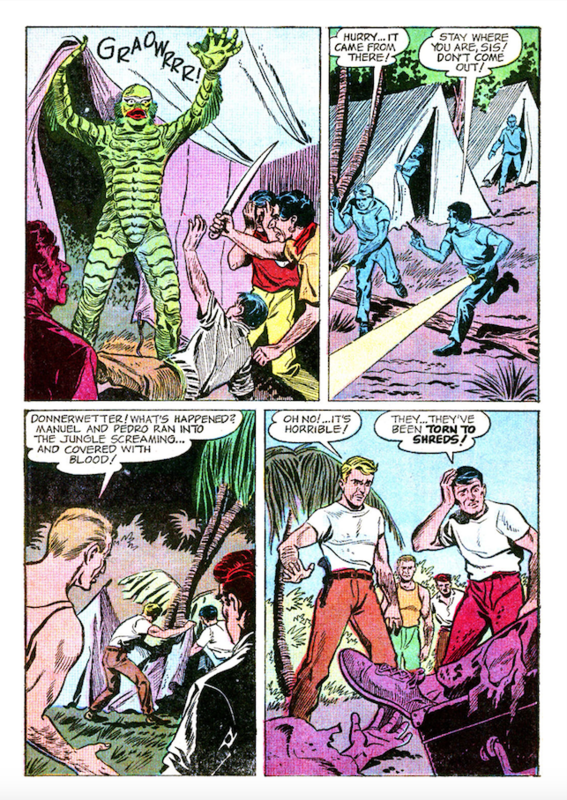 Why the book goes into page after page of Scott and Dudley arranging the various members of the expedition is baffling, because it’s just a bunch of talking heads when we all want to get to the Creature! That’s what we paid our 12 cents for, dammit! Still, since the comic retains most of the film’s basic plot, it ends up coming closest to replicating the charms of the Universal favorite. The Creature From the Black Lagoon was a late addition to the Universal Monster stable, and ostensibly the last creation that achieved the iconic status of Dracula, Frankenstein, the Wolf Man and the Mummy. He is a perfect subject for a comic book, so it’s a shame that Dell came so close to producing a classic, only to (once again) allow Bob Jenney to handle the art, stripping the story of any menace or mood. Still, we have that classic cover, which is good enough for framing! While none of these Movie Classics will go down as, well, classics, they must have been fairly popular with kids at the time. Dell did second printings on most of them, and even released another one-shot that reprinted Dracula and The Mummy together. I’m betting Vic Prezio’s outstanding covers had a lot to do with that, and the fact that kids love monsters. Always have, always will. Rob Kelly is a writer/artist/comics and film historian. He is the co-host of The Fire and Water Podcast (and the host of its sister show, The Film and Water Podcast), the co-creator and writer of the award-winning webcomic Ace Kilroy, and the creator of the book Hey Kids, Comics! : True-Life Tales From the Spinner Rack. His favorite Universal Monster is the Wolf Man. It was nice to read along with the synopsis, and not go “Wait, when did THIS happen?” with every sentence. Thanks for covering these Rob, and thanks to Dan for running them. I’ve always wondered about these comics, and now I know. They were quite the Halloween treat!